In order to insure success in our procedures, we take the necessary time to fully and thoroughly evaluate your present dental condition. We use the appropriate diagnostic tools such as X-rays, photographs and full periodontal exam. Our goal is to give our patients the necessary information and education so that they may enjoy a beautiful, healthy smile. Most children and adults should get a regular dental cleaning and check up every six months. 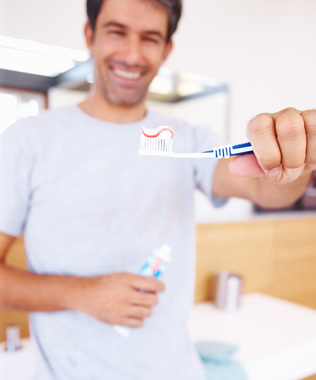 People at a greater risk for oral diseases should have dental check ups more than twice a year. Night guards are developed to address the needs of those who grind and/or clench their teeth. The main reason people clench and grind their teeth is due to stress. Clenching and grinding not only causes excessive wear on teeth, but daily stress (long term and short term) can cause the facial muscles to overwork and become sore. A mouth guard is designed to help buffer the mouth and teeth from trauma. Wearing a mouth guard is common in contact sports such as hockey, football, boxing and basketball, but a protective mouth guard can also be beneficial in non contact sports such as skiing, snowboarding and skateboarding.